Falcon offers unsurpassed soil sample quality because it is precise, it takes a lot of cores really fast, and it mixes multiple cores very thoroughly into a representative composite sample. That’s important because the number of cores making up a sample has a big impact on the reliability of the sample data. 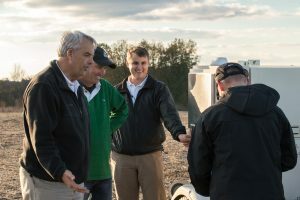 Given the limits of traditional hand probe sampling technology – with everybody doing the best possible job – it’s simply not feasible to collect enough cores for samples to be as accurate and reliable as we might like. With eight cores, the accuracy level for P samples can be as low as +/- 25 percent, according to North Dakota State University research. With Falcon able to gather about one core every second, farmers can expect accuracy approaching +/- 5%. It’s no secret that when fertility is low, adding just the right amount of fertilizer can make bushels of yield difference. By delivering reliable data, Falcon cuts risk and maximizes potential returns.